iPhone demand, and faith in Apple, is so high that over 20 percent of all iPhone users intend to buy an as-yet unannounced 2018 model in the next year. Apple hasn’t even announced its next generation of smartphones, and millions of people already want them. In fact, interest in upgrading to any iPhone is extremely strong. A survey of iOS users found that almost twice as many people are interested in moving to a newer model as last year. 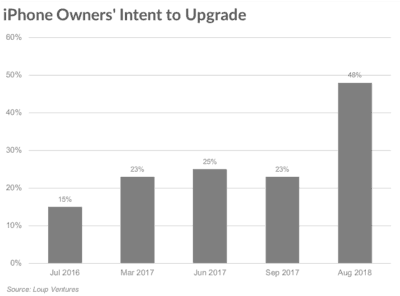 “This survey showed a surprisingly high intent to upgrade, suggesting 48% of current iPhones owners intent to upgrade to a newer iPhone in the next year, compared to 25% in June of last year,” wrote analysts Gene Munster and Will Thompson from Loup Ventures, who conducted the survey. iPhone demand is far higher than it’s been in any of the preceding four years. iPhone demand is highest for Apple’s new offerings. Of survey respondents who said they intend to upgrade, 42 percent plan on buying one of the three 2018 iPhone models expected to be announced next month, 18 percent have their eye on the iPhone X, 16 percent want an iPhone 8, and 24 percent are considering another iPhone. Plus, Apple should expect to acquire some customers from its rivals. “19% of Android users surveyed indicated they plan on switching to an iPhone in the next year, compared to 12% last year,” wrote the analysts from Loup Ventures. Other studies have shown Android users are more likely to switch to iOS than the other way around. Munster and Thompson predict that “iPhone is entering a period of stability.” They expect somewhere between no growth and 5 percent growth each year for several years. In other words, no “super cycles” of extreme demand, nor any declines in sales. With such strong demand for the 2018 iPhone models, it’s a good thing Apple is making so many of them.